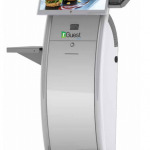 Learn about kiosk enclosures such as standup pedestal, countertop (or desktop) and wall-mount. Also thru-wall. Custom kiosk enclosures as well. Click for full size of hybrid kiosk used by City Markets for Scan Bag Go program in King Sooper supermarkets. 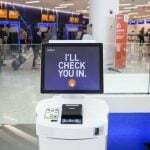 Manufactured and designed by Frank Mayer and Associates, Inc.
Olea Kiosks – custom kiosks and standard kiosks for all applications and verticals. 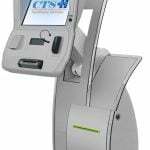 KIOSK Information Systems –custom kiosks, standard kiosks, full software development, remote monitoring and managed services. 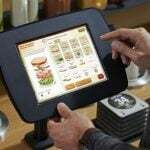 Turnkey Kiosks – specializing in turnkey systems of all types. 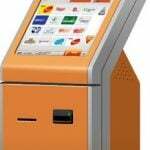 You have custom kiosk and standard kiosk designs. 90% of the time it is a standard or a modified standard. 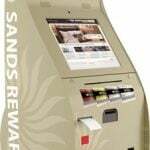 Custom design kiosks require NRE and design. “Owning the design” becomes another issue. 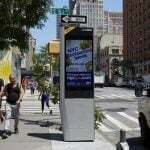 Kiosk enclosure design and manufacturers are all over the world. Most countries tend to use enclosures designed in that country. Generally the best looking designs have often come from Europe where contours are generously used. In America better servicing with nice looks tends to be base denominator. The most extensive cataloguing of designs has unfortunately been the Chinese to date. 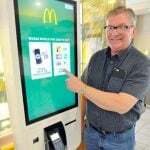 High run terminals like UK Job Centre kiosks where 12,000 were done are injection molded. The number of units counteracts the cost of the initial tooling. Knockout panels for adding component later are rarely used . Just makes for a more flexible standard offering for manufacturers to work from. Internally kiosk metal can be unfinished or deburred. After cutting my fingers x amount of times over and over, when I set a deburred internal I always heave a sigh of relief now. Enclosures last longer than the components inside them. 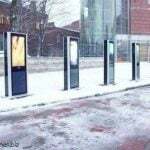 Kiosk designs are often a family of design so you can incorporate design elements into whichever form factor is being done whether a fully loaded unit or a “lite” unit for example.